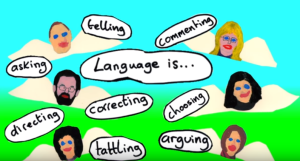 Don’t Be a Language Stealer! Wanted to share a favorite video of mine! I’m sure many of you have already seen it! “Don’t leave anybody asleep in their wheelchair!” – This line really resonates with me. I find that often I see students in wheelchairs not participating as much as they should be! 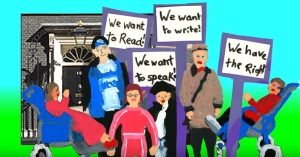 Don’t forget that language is so much more than requesting! And so much more than a book of nouns! 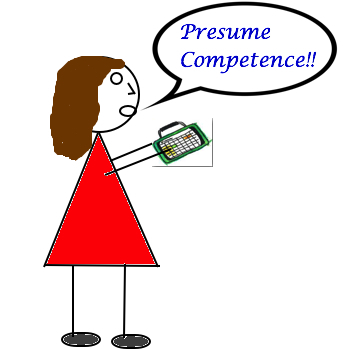 This week, I’ve been thinking a lot about presuming competence. I wish I could reach every special educator, therapist, and teacher I work with (and beyond!) and get them to see the value and importance of presuming competence. It’s an uphill battle, but one that I won’t give up without a fight! I thought I’d post some resources I’ve found helpful, insightful, or interesting! Check out the Uncommon Sense blog. It has some great posts including two of my favorites about perception driving expectations and giving AAC users a large vocabulary so they can show their competence! This resource by Dr. John Hussman is a must read. And of course, Kate Ahern’s “I Believe” statement, which everyone working with our specials students should read! 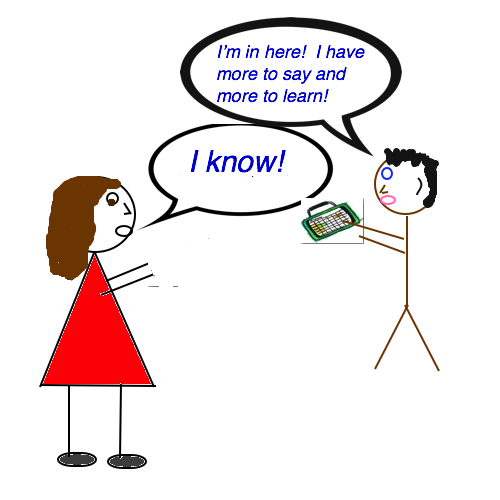 Presuming Competence – What is it?! What is presuming competence? Essentially, it means that if you’re not sure about a particular kid, for whatever reason, assume that the student can do more! Douglas Biklen explained: “Assume that a child has intellectual ability, provide opportunities to be exposed to learning, assume the child wants to learn and assert him or herself in the world.” Check out his article on the subject here. This is the statement that resonated most with me. At school and at conferences, I often hear about providing the right supports to students. As an AT Specialist, I’m often lobbying to get students the correct supports including AAC devices. But, if educators, administrators, therapists, classroom aides, parents, etc. don’t presume competence these supports are likely not going to be used to their fullest capacity. We must have a foundation of presuming competence in order utilize those supports in the best way! Presuming Competence – Who’s Doing It? 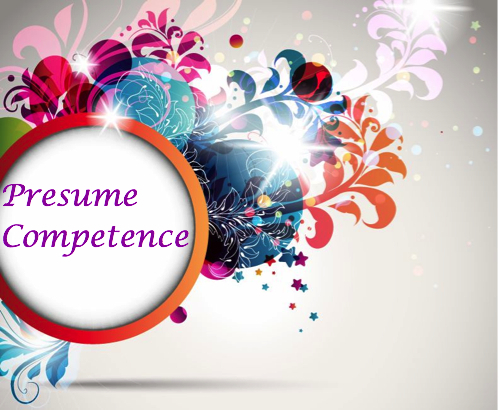 I love the phrase “presume competence!” I hear it all the time. I use it all the time. What’s interesting is that I just don’t see it very much! 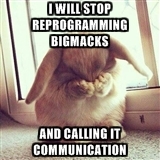 If you’ve been to any conferences or trainings lately, I’m sure you’ve heard this phrase too. It’s all over special education blogs, AAC facebook groups, etc. But what strikes me as interesting is that even with so many people yelling “PRESUME COMPETENCE! !” there are still so many more who aren’t. And that makes me sad! And mad! I know it’s not always easy when you’re not getting the response you hoped for or you don’t get a response at all. But please don’t give up on these kids! It just means you haven’t found the right way to teach them yet or unlock their potential. As an AT Specialist, I often read previous reports when I have a student to screen. I often read recommendations for a student to use a Big Mack until he learns cause and effect or an 8 cell so as not to overwhelm her. Then when the student is not using those devices, they are abandoned and I hear “well nothing works.” Give your students a chance! If you give them access to more language, model it, and have high expectations… I bet you are going to be surprised! This year I was lucky enough to share some of my experiences at Closing the Gap. 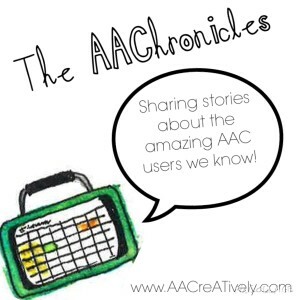 My partner, Nicole VanderZouwen, and I spoke about getting started with the AAC evaluation process. We spoke at length about what types of systems we consider and our experience with adapting systems based on access. Check out our presentation here! One of the follow up questions we received was “do you have a specific form or process you use to get started?” We do! And we’ve been refining our process for the past year, though I still think we’re not all the way there yet! You can download our form here. 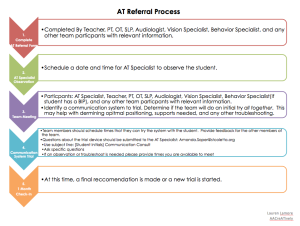 We also created a document to the AT Referral Process for team members to reference. When Lauren first suggested this series, I was a little hesitant. What if we didn’t have a story to post every week? But we work with some pretty amazing kids and it looks like this series is going to be a piece of cake to keep up! 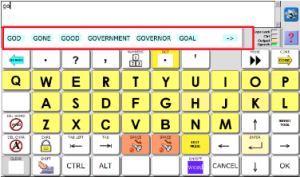 When I first started working at my school, a lot of the students did not have individual AAC systems. And those who did often had a “PECS book.” I use this term loosely because it was in no way used as a picture exchange system. After I did my first teacher training on using core words to communicate, one of the teachers immediately went back to her classroom and printed a 50 cell core board to try with her students. She was a little skeptical but had a student with some behaviors that she was desperate to figure out a system for. Well that first day, he saw the board and started using it to say simple one word utterances with little training and modeling. His speech therapist jumped in and pretty soon he was using some two and three word phrases too! He has a high tech device now and is really interested in learning to spell and read! This week, while working with him and his aide I noticed that he was being given a picture of a CVC word and letter tiles of the exact 3 letters needed to spell a word. I asked his aide if we could challenge him a bit by giving him all of the letter tiles. He immediately spelt the first word “CAN” when given a picture of a can. Then he was given a picture of a bed. He picked up the letter tiles “SLE” and then began to yell. I quickly realized he was trying to spell “sleep” but only had one “E” tile! So I pulled up the keyboard on his Accent device. Click here to find out more about the Icon Tutor on the Accent devices by PRC. Merry Christmas! Last week while we were still in school, a parent asked her daughter’s SLP to unmask “Santa” and “presents” on her daughter’s Accent 1000. The SLP did and pulled her for a session so she could show her the new words. They read a quick story about Santa and the SLP asked the student if she would be leaving cookies and milk for Santa this year. The student then replied “pop” and laughed! Her therapist was so excited to share the story because even though “pop” (soda) is in the drink section, they had previously only really used it to talk about popping bubbles. The student was cracking up over the idea of leaving “pop” for Santa instead of milk! Later in the session, she also used “”pop” to ask to pop some bubbles! We’re really proud of this smart girl for understanding that some words have multiple meanings and using them appropriately! GO AWAY, big green face! 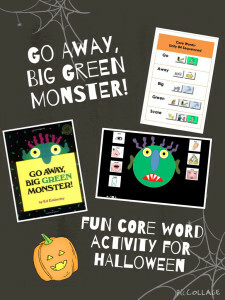 GO AWAY, BIG GREEN MONSTER by Ed Emberley seems as if it was made for core word instruction. The book describes each feature on the face of a horrible BIG GREEN MONSTER followed by the narrator telling them to GO AWAY. Continue reading to download a PowerPoint activity to go along with the book.